While it may seem out of reach for most cash-strapped students, you would be surprised at how affordable and useful tenant insurance can be. As a tenant, you are not insured for the contents of your place, and you may not be covered for liability. 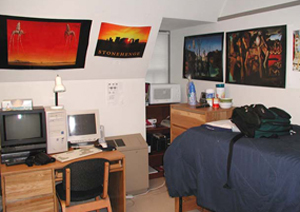 As a student, you may not think that your room's contents are worth a lot of money. But imagine if everything were destroyed at once, how much would it cost to replace everything? Would you be able to afford it? Computers, televisions, beds and clothes can be expensive to replace. You could be on the hook for a few thousand dollars if flooding, which is quite common is student homes, destroyed your things. More importantly, however, you may not be covered for liability under your landlord's insurance policy. This means that if you host a party and your guests cause damage to your home, you could be on the hook for repairs. Alternately, if someone hurt themselves and you were found liable, you could be forced to pay legal and medical expenses. These expenses can cost tens of thousands of dollars, if not more. If you're a student, take a few minutes to call an insurance broker or get an online quote. It may only take a few minutes to call a few insurance companies to get a quote. You would be surprised at how affordable and practical tenant insurance can be! Of course you need insurance, especially if you a first year student and you far away from home. First year is the toughest, so you should be aware of many issues. It is hard to get used to a new place. Sometimes you miss the deadlines, and there is a lot of homework to do. When it's really hard, i was using help services like https://www.amblesideprimary.com. So don't take long, get a tenant insurens and don't be afraid to ask for help.